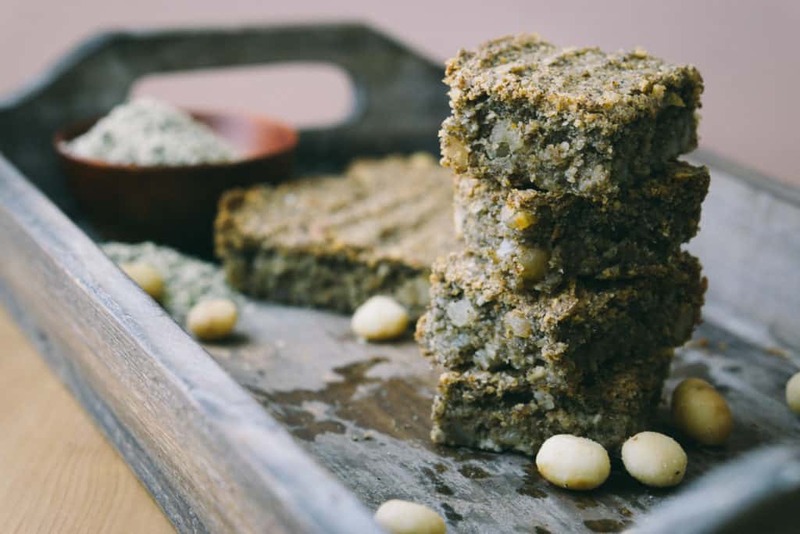 These Vegan Meal Replacement Bars are a delicious stroke of genius made by Matt. Don't let the word vegan deter you from watching the video or trying these. They are also dairy free, low carb, high fat and can be nut free if you remove the macadamia nuts! Perfect for making with the whole family or sending to school with your kids without breaking any of the allergy rules at school. We have been receiving more and more questions about doing dairy free keto or what are good dairy free options on a keto diet. First, let me tell you that it is absolutely possible. Both of us have done it and there are a lot of great substitutes, and this recipe uses a lot of them. Chia seeds act as a great binding agent, replacing the egg, coconut oil replaces the butter and coconut milk is our favorite of all replacing the heavy cream! Other dairy free snacks/recipes we love are our keto breakfast bowl, vegan protein bowl and toasted pecans with bacon! There are a lot of low carb protein bars on the market, but most of them aren't high fat too. The goal of these bars was not to create a vegan bar, but to create a low carb, high fat option for you and your family. If you are looking for a dessert like, pre-packaged bar, Keto Bars are a great option. The downside to a lot of bars on the market are the overuse of soluble fiber and erythritol, which we don't love consuming daily. Once you make these you'll forget they are vegan, unless you're not opposed to that! 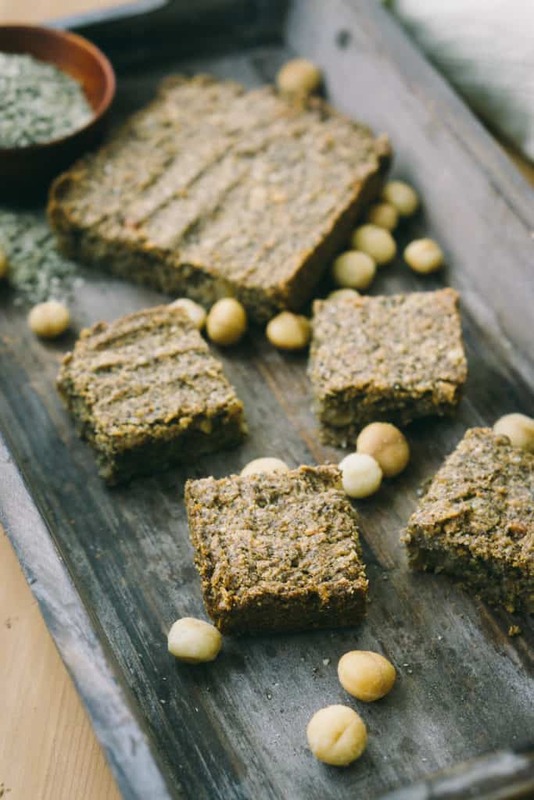 We often get people who don't want to see vegetarian or vegan recipes, but we love them as much as the next person, especially these meal replacement bars. They are moist, fatty and crunchy from the nuts and extremely filling! They would be a great way to start your day off or even pack in your kids lunch boxes so go ahead and make these vegan meal replacement bars and enjoy the dairy free life! 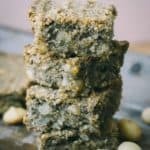 Recipe can be quickly added to MyFitnessPal - Search "KetoConnect - Vegan Meal Bars"
Refrigerate your coconut milk over night or freeze for 10 minutes. Preheat your oven to 350 degrees and line a bread loaf pan with parchment paper. Add the ground chia, ggolden flax meal, ground coconut flakes, ground hemp hearts, macadamia nuts and salt to a large mixing bowl. Combine with a spatula. Remove the coconut milk can from the fridge/freezer and transfer the solid part to a microwave safe bowl, leaving the liquid at the bottom. Add coconut oil to the same bowl and microwave for 30 seconds (coconut milk should be melted). Add in the stevia and pour the entire mixture it into the dry ingredients bowl. Combine using a spatula until uniform in consistency. Pour it into the loaf pan and let it rest for 10 minutes. Bake for 50-60 minutes until it has browned and set. Let it cool for 15 minutes and then remove from the pan. Store in a ziploc bag and store on the counter top for 3-4 days or up to 1 week in the fridge. Note: You can easily pulse all your dry ingredients in a coffee or spice grinder to make them ground.